AAA projects 1.77 million New Englanders will travel this Memorial Day an increase of 2.8 percent. This is the highest Memorial Day travel forecasted since 2005. Holiday air travel is expected to increase 4.8 percent to 140,00 leisure travelers. 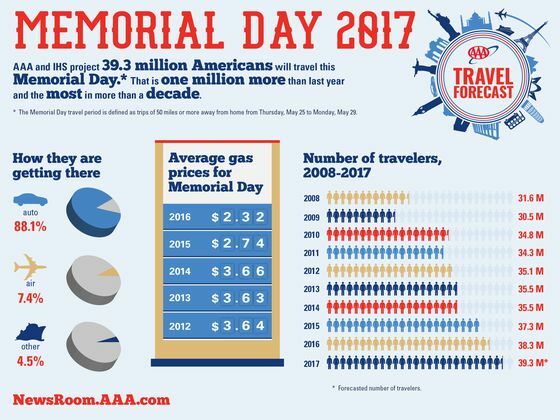 While AAA expects most U.S. drivers will pay the highest Memorial Day gas prices since 2015, the vast majority of holiday travelers (88.1 percent) are still planning to hit the road. Automobile travel will grow by 2.4 percent this Memorial Day, with 34.6 million Americans planning a holiday road trip. The national average price for a gallon of gas today is $2.37, 7 cents more than last year.